ĐÀ NẴNG — A new bus service has been launched in the central city connecting the downtown area with the Đà Nẵng Hi-Tech Park to offer more convenience for commuters, workers and engineers at the park. 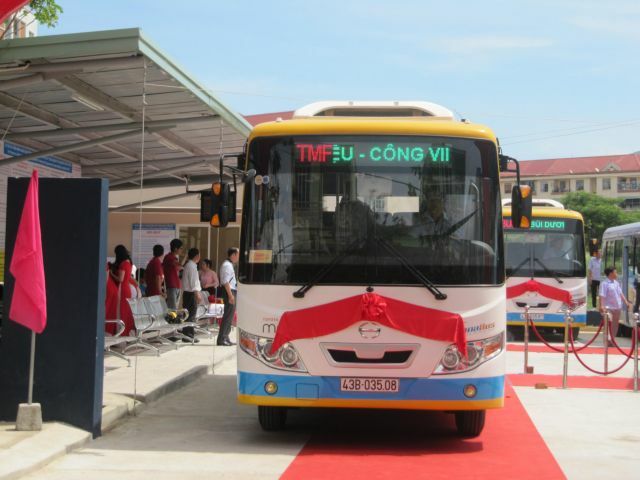 The bus route, which opened on Monday, is the first to link the city centre with the Hi-Tech Park and a complex of Industrial Zones in Liên Chiểu District. Director of the city’s Department of Transport, Lê Văn Trung, said the new 40-seat busses will run every 30 minutes between 4.30am and 22.10pm with ticket prices of VNĐ5,000 (US$0.22) daily and VNĐ45.000 ($1.9) for monthly travel. The route departs from March 29 Park to wind through Điện Biên Phủ, the Huế Junction, Hoàng Thị Loan, Nguyễn Sinh Sắc, Tôn Đức Thắng, Nguyễn Lương Bằng, Hòa Khánh Industrial Zone, Âu Cơ, South Hải Vân Tunnel ring-road and the Hi-Tech Park. In 2017, the city, in co-operation with Toyota Mobility Foundation (TMF), also debuted 61 new 50-seat busses on five routes operating every 20 minutes between 5am until 9pm. Currently, 11 public bus routes with subsidised fares are serving local residents, students and workers with safe and environmentally-friendly vehicles. The city also offers bus tracking apps on mobile devices for commuters as well as wireless internet services on the bus routes. Đà Nẵng plans to build 25 public car parks by 2020 to deal with the shortage of space, and the first smart car parking is under construction on Phan Châu Trinh. The city has 69,000 cars, 800,000 motorbikes and over 5,000 electric bikes, excluding cars and personal vehicles from localities that pass in and out of the city everyday. Đà Nẵng is the only city in Việt Nam to provide free parking at public hospitals. Bus routes have also been opened from the city to Hội An, Tam Kỳ, Duy Xuyên, Quế Sơn, Đại Lộc and Tam Kỳ in Quảng Nam Province. Locals make 2.1 million journeys each day, of which 80 per cent are via motorbike, according to the city’s transport department. In 2017, two open-top bus routes were opened in the city for tourists travelling between the international airport and Sơn Trà Peninsula from 7am to 10pm each day.